To make sure that the tape will show in specific areas of the box, I first folded the box with plain copy paper and unfolded it, keeping in mind the specific areas I wanted to decorate. 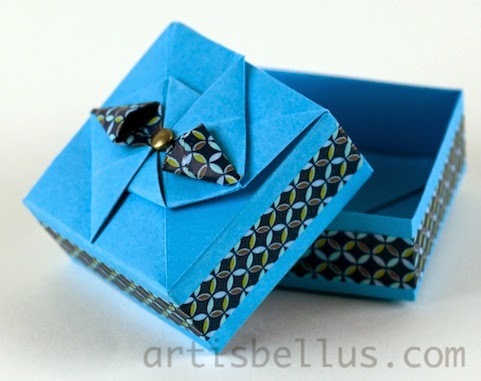 Then I applied the washi tape in those areas, and refolded the box, reinforcing the creases where the tape was applied. I used two 4¼" x 11" (108 mm x 279 mm) rectangles of color copy paper, one for the bottom of the box and another one for the lid. I like that! You did such a nice job of choosing the paper and tape to match, arranging the tape artfully, and of course, the folding itself.